Clifford Thompson, City University London MA in Creative Writing alumnus, received a scholarship from the writers' colony The Norman Mailer Centre over the summer. The Norman Mailer Centre awards scholarships to promising writers to continue the literary legacy of the twice Pulitzer Prize winner, Norman Mailer. Following Mailer's death in 2007, the Centre was set up by Mailer's long-term friend and collaborator Larry Schiller, in order to foster the talent of a new generation of writers. It's supported by Mailer's family and fellow writers, including Salman Rushdie and GQ Magazine. As part of his scholarship Clifford spent three weeks in the US and was invited to attend the Centre's On the Road programme held at the University of Utah; a workshop for promising writers. More than twenty writers were invited to participate, with places awarded for fiction, non-fiction and poetry. Previously Clifford worked as a firefighter before becoming a staff journalist at the BBC where he has worked for twenty years. He has a BA (Hons) in Humanities from Birkbeck, University of London and City's MA in Narrative Non-Fiction, from which he graduated in 2012 with a distinction. We caught up with him to ask him about his experiences on the prestigious programme. 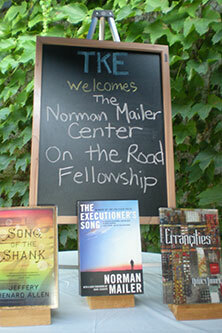 What is the Norman Mailer Centre? The Norman Mailer Centre and Writer's Colony is an educational non-profit organisation that aims to foster the values of Mailer's work in new generations of writers. Alongside awarding scholarships, the Centre offers creative writing workshops, student and teacher writing awards and retreats, as well as educational, monetary and professional support for writers commencing their career. Why was Utah chosen as the location of the workshop programme? Salt Lake City, Utah, was where Mailer researched and interviewed those connected to the murder of two young Mormon men by Gary Gilmore in 1976. The result of his interviews was the famous Pulitzer Prize winning book The Executioner's Song which was published in 1979. The programme has been running since shortly after Mailer's death, but went 'on the road' for the first time in 2013 with workshops held at the Mailer family apartment in Brooklyn Heights, New York where Mailer lived and wrote for forty years. The Centre plans to host each of its annual programmes in locations that feature in Mailer's books - in 2015 the programme will visit Florida - the setting for Miami and the Siege of Chicago. How was your experience of the programme? It really was an amazing opportunity to learn and develop as a writer. Not only did we gain from intensive group work, but our mentors were some of America's most notable novelists and poets. I was tutored by Bev Donofrio, author of Riding in Cars with Boys, but also had the chance to meet the poet and biographer of Miles Davies, Quincy Troupe. We also got to spend a lot of time with the Centre's founder Larry Schiller. Schiller worked closely with Mailer - he did all the interviews and negotiated the contracts for the interviewees for the book and film version of The Executioner's Song. Larry was with us throughout our time in Salt Lake City. He was a constant source of inspiration and shared many of his tales about working with Mailer. We also had opportunities to tour Salt Lake City and attend historic programmes, including the public screening of The Executioner's Song at Salt Lake City Library. The most interesting part was that there were many local people there who remember the murders and whose lives were so dramatically changed by them. At the screening we had a Q&A session with Schiller, Bob Moody, one of Gilmore's legal team and two of the journalists who were first to report on the murders, including Tamara Smith (who at the time was a cub reporter on the Desert News). What did you work on while you were in the US? There were some taught classes where we were given a subject to write about and we developed the tale in our own time, providing feedback for each other in our group the next day. Donofrio was brilliant - she suggested several ways of thinking differently about approaching and writing non-fiction subjects both in terms of characters and stories. I also spent some time reviewing and editing the book I wrote for my MA and I started writing a new book - a historical narrative non-fiction book about Eyre Massey Shaw, the Victorian founding father of 'modern' firefighting and his relationship with Bertie - The Prince of Wales (latterly Edward VII). Information about the 2015 workshop and applications will be released from February 2015 onwards. I can highly recommend applying - it was a truly wonderful, immersive and inspiring experience. Visit www.nmcenter.org for more information.